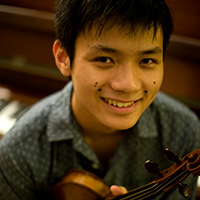 23 year old Gabriel Ng began learning the violin when he was 4. He is currently studying at the Guildhall School of Music and Drama under the guidance of David Takeno. Some of the international awards that Ng has won include the 2007 Grand Prize winner of the XIV Andrea Postacchini International Violin Competition in Italy and the Bach prize at the 2012 Menuhin Violin Competition in Beijing. He was invited to perform as soloist at the inaugural President's Command Performance and the Esplanade's 10th anniversary gala concert with the Singapore Symphony Orchestra. Ng was also soloist with the Royal Philharmonic and Ho Chi Minh City Ballet Symphony Orchestras, and has given recitals in the UK, Rome, Jakarta and at the Gstaad Music Festival. He has also been featured on BBC Radio 3 and Radio Television Suisse. Ng is also an avid chamber musician. His chamber groups have won numerous prizes and have given performances in the Barbican Hall, Wigmore Hall, St John Smith's Square and LSO St Luke's. His performance of the Elgar Violin Concerto with the Orchestra of the Music Makers in 2010 has been released on CD to critical acclaim.